Around 1970, a new type of circular saw started making its appearance in sawmills. This new design featured guides, instead of a collar, to support the saw directly below the cutting region. This allowed much better cutting accuracy as well as the use of thinner saws and/or faster feed speeds, thus lowering production costs. Optimization of saw thickness and feed speeds can be determined by trial and error, but the results are most often specific to the particular conditions in that sawmill, and not generally applicable to other mills. Work on the development of an engineering model that could predict saw behaviour was thus initiated by sawmill equipment manufacturers, saw makers, and university researchers. The first models proposed for guided circular saws were developed to calculate critical speeds, but did not yield the desired predictability. Cutting experiments at FPInnovations’ Sawing Laboratory in our Vancouver facility showed that guided saws cut very well even at critical speed, but that every blade will reach a rotation speed at which it starts to vibrate wildly (the flutter zone), even while idling. The inability of the models to predict the effects of critical speeds and the onset of the flutter zone resulted in the sawmills having to send saws to our Sawing Laboratory to be tested individually, if a speed increase or a change in plate thickness was required in their operations. Ahmad Panah, a wood machining scientist at FPInnovations’ Vancouver facility, has recently completed his PhD in mechanical engineering. His research work included the development of a refined model for guided circular saws that would correctly predict the onset of the flutter vibration and good cutting performance at critical speeds. This research has resulted in the creation of a set of charts and tables to assist mill personnel in evaluating their saws. A publication containing these tables will be available soon from FPInnovations, and a webinar will be held to explain the new information. This October, FPInnovations will expand the support it offers the forest industry through a new networking and professional development opportunity in Prince George, B.C. The event, a one-day woods-to-mill symposium for fleet transport professionals, will include workshops and networking opportunities, as well as a supplier forum. Rittich attributes this to a lack of time and opportunity to thoroughly research and understand what proven tools are out there that can help fleet managers, planners, coordinators and procurement specialists improve efficiency and safety in their daily operations. And, since forest fleet operators tend to be risk adverse, information can help address the concerns of managers about adopting new technologies. He notes that although factors such as the difficult economy, increased international competition, and damage to harvests caused by pests have motivated forest fleets to scrutinize operations, there are still plenty of fleets who have yet to fully take advantage of existing technologies and processes that could improve efficiency and safety, and ultimately save them money. “Our own experience—and feedback from our members—tells us that there needs to be a forum for forest fleet professionals to connect with each other and with suppliers so that they can share best practices and stay up-to-date with the latest advances,” explains Rittich. The seminar will target everyone from fleet owners, managers, and dispatchers, to transport supervisors, regulatory officials, and health and safety officers. Workshops will cover innovations in the log and chip haul sectors; a look at logistics planning tools for fleets and forest companies; driver recruitment and training; energy efficiency technologies; intermodal transport options; collaborative models for transportation; and accident prevention and best practices in trucking. This fall’s seminar will be the first of this kind offered by FPInnovations and the intention is to offer the event annually in Western Canada. For more information, contact Cameron Rittich, Senior Scientist at FPInnovations. Email: Cameron.Rittich@fpinnovations.ca; telephone: 604 222-5740. Faced with intense global competition, Canada’s forest sector is seeking improved solutions and new ways to add value for customers and end consumers. FPInnovations plays a lead role, working with research partners, in helping the forest industry innovate based on transformative breakthroughs in science. Among such game-changing opportunities are technologies based on the rapidly advancing study of genes, known as genomics. “Genomics has created waves of innovation all around the world, particularly in the areas of human health and medicine. Now, the game-changing potential of genomics is ready to be brought to our forests,” says Pierre Lapointe, FPInnovations’ CEO. Genomics is the study of a species’ DNA, known as its genome. In sequencing the genome of individuals of a species, scientists find differences between them at given positions in their DNA. These differences are called DNA markers. These markers help identify genes that code for particular traits expressed in individual organisms of that species. Lapointe is enthusiastic about the prospects of genomics solutions to put Canada on a strong competitive footing. “Forest genomics is giving us the knowledge to grow better forests, faster. 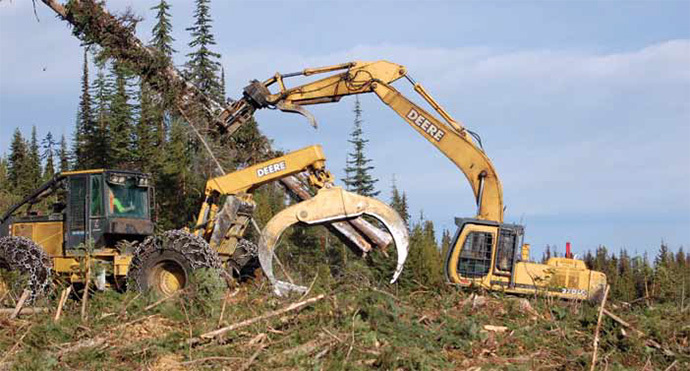 FPInnovations is eager to help turn this knowledge into powerful innovations that will give Canada’s forest sector a significant competitive advantage,” Lapointe adds. Already, Canada’s forest research community has completely or partially sequenced genomes for a few commercially important tree species and for some pest species that impact the forest resource. A research team centered at Laval University is helping to accelerate traditional tree breeding using genetic markers, a method called genomic selection. In the case of white spruce, conventional methods require up to 30 years to breed and test trees in the field for improved growth, adaptation and wood fibre value. With genomic selection, the time is significantly reduced—to six years—permitting nurseries to rapidly select trees for reforestation programs. The Laval University team is led by Dr. Jean Bousquet, Canada Research Chair in Forest Genomics. The team includes collaborators from Natural Resources Canada’s Canadian Forest Service and the Canadian Wood Fibre Centre, among others. “Just as we can decode the genomes of trees to select for the best growth and wood quality, so too can we use their genetic profiles to identify trees that have an inherent level of resilience,” says Bousquet. “Genomic selection is also very promising when it comes to breeding trees that will be more resistant to pests and pathogens, and current efforts focus on developing planting stock with such attributes,” adds Bousquet. An advantage of this approach is that it does not modify the genetic material of an organism. Its focus is on learning how genes naturally control physical characteristics, then using this knowledge to support particular management objectives. 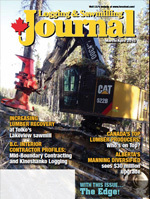 “Such objectives include producing wood for desired end-uses, growing forests to survive in the face of pests and changing climate, and providing customers and producers with more certainty about the source of products,” as indicated by Dr. Jean Beaulieu, member of this team and research scientist with the Canadian Wood Fibre Centre and NRCan. Hamelin’s research team has developed DNA diagnostic kits to detect markers of pathogens before there are visible symptoms, permitting the early identification that is key to quarantining and destroying the infected plants before the contagion spreads. Likewise, these diagnostic kits can be used to identify traces of pests when the insects are too early in their development for a reliable visual identification. Looking beyond the cost-savings from improved and accelerated breeding, and reduced risk of losses from pests and pathogens, genomics can give Canada’s forest products an edge on international markets. “Using genomics, we can certify that our wood products are of a certain quality, and free of pests and pathogens,” Hamelin explains. There is more than promise to the rapidly progressing field of forest genomics. There are already some tools available—and more in mature stages of development —that can change the way industry does business, from rapidly producing genetically improved planting stock to reliably detecting the presence of damaging agents, to certifying the quality of raw materials and end products. It all adds up to a greater ability to manage for value along the supply chain. However, Canada is not the only country to see the benefits of genomics. “We’re among the world leaders in forest genomics but other countries are moving fast,” according to Hamelin. Among the developed countries, Sweden, the U.S. and France in particular are investing significantly in forest genomics, and developing countries such as China and Brazil also have strong forest genomics programs. The race is on to remain competitive. Effectively harnessing and applying Canada’s forest genomics capacity will help our industries stay in the game. Alberta Innovates Bio Solutions (AI Bio) supports more use of innovative biomaterials and wood products in construction. But use of these building materials will only increase if important issues like fire safety are addressed, particularly as construction of taller all-wood buildings takes hold. Fortunately, as building codes change to permit mid-rise buildings, many concerns related to fire safety have been addressed through research work done by organizations like the National Research Council of Canada, NEWBuildS, FPInnovations and the Canadian Wood Council (CWC). AI Bio is a financial supporter of many of these organizations, and also recently sponsored a tall-building seminar for industry professionals in Edmonton. Installation of sprinkler systems in key areas of taller wood buildings is expected to have a major impact on addressing fire safety issues. While wood-product manufacturers saw a business opportunity in taller, all-wood construction from four to six storeys, they also recognized a need to invest in studying issues related to health and safety, structural integrity and fire performance, says Michael Giroux, CWC president. Changes have been made to building codes in B.C. and Ontario, and are being considered in Quebec, as a result of this work. These include sprinklers installed throughout building living areas, installation of sprinkler systems on balconies, non-combustible cladding on building exteriors for upper floors, and sprinklers in void spaces. Expected changes to the National Building Code of Canada, allowing for all-wood, mid-rise construction up to six storeys, will also include these requirements. Len Garis, past president of the Fire Chiefs’ Association of B.C., adjunct professor at the University of the Fraser Valley School of Criminology and Criminal Justice, and the current City of Surrey fire chief, was actively involved in gathering and presenting fire safety data when both B.C. and Ontario recently agreed to allow in their building codes the construction of all-wood buildings from four to six storeys. Some of his research at the University of the Fraser Valley was financially supported by the CWC. Garis studied about 2,000 fire incidents in B.C. over a five-year period in three- and four-storey wood buildings. Of those, 565 had sprinkler systems and 1,377 did not. Garis says fire occurrence during building construction continues to be a concern and the CWC agrees. Garis is currently working on another CWC-funded study at the University of the Fraser Valley aimed at designing an operational document to help developers follow best practices during the critical construction phase of all-wood or wood hybrid mid-rise construction. 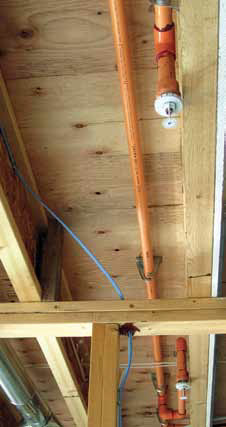 However, because there are still so few all-wood or wood-hybrid higher-rise buildings throughout the world, being able to fully assess the fire risk at this time is more difficult since there is little historical data available for review, the fire chief says, Installation of sprinkler systems in key areas of taller wood buildings is expected to have a major impact on addressing fire safety issues. The Canadian Wood Fibre Centre (CWFC) has successfully tested and demonstrated a newly-developed, Canadian-built, biomass compaction and storage system. The system, designed and built in Quebec by Gyro-Trac Corporation, can compact various types of woody biomass, such as sawdust, chips, shavings, bark, branches and even construction waste, into 48” round bales. The woody biomass compaction and storage trial was conducted in Nova Scotia as part of CWFC’s program aimed at demonstrating various biomass densification, conditioning and handling methods for reducing the cost of transporting woody biomass between the harvest site and production facility. This project was funded under the Program of Energy Research and Development (PERD) through Natural Resources Canada. It is investigating a variety of biomass densification, conditioning and handling methods in many different environments across Canada. The compaction and baling technology was originally developed to compact municipal waste and construction debris into dense round bales by Recyclage Ungava in northern Quebec, to reduce transportation costs. The system consists of a 265 hp power unit, collection hopper, an auger that can reconstitute the debris, and a conveyor that transports the debris from the auger into the compaction and baling unit. 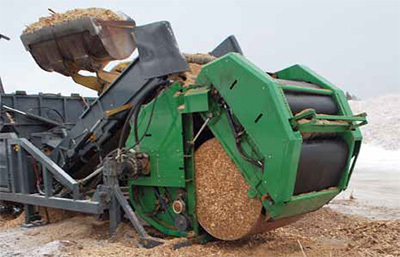 Unlike the Gyro-Trac BBS system demonstrated earlier this year by CWFC—where the mobile unit equipped with a mulching head and chipper can mulch, chip and produce a compacted round bale all at the same time—this stationary system requires a loading implement such as a front end loader to feed the unit. Keddy says this system, while stationary, is capable of producing more bales per hour and can be loaded onto a flatbed truck and moved from one location to another, with set-up taking about an hour. Keddy says the purpose of the demonstration and trial in Nova Scotia was to address two issues related to biomass transportation and storage. The initial phase of the trial is to evaluate the feasibility of reducing biomass transportation costs by packaging woody biomass into compacted bales. Depending on the moisture content and bulkiness of the biomass, trailers filled with woody biomass typically are not capable of reaching their maximum legal weight, therefore increasing the transportation cost per tonne. In one test at Shaw Resources, a truck trailer with a 53’ walking floor was filled to capacity with mill residue shavings. The shavings were then unloaded and compacted into bales. The compacted bales, once reloaded onto the trailer, resulted in less than 45 per cent of the trailer being occupied. The ability to transport more than twice the volume of biomass per load could result in significantly reduced transportation costs. The second phase of the trial is to evaluate the long term storage potential of biomass compacted in round bales. Moisture content increases during storage, which can result in decomposition and methane build-up in storage piles, and it’s an issue that is consistently being studied. Researchers wanted to know if the moisture content would remain stable or even decline during storage if the biomass was compacted into round bales. CWFC baled three types of woody biomass, wet unhogged bark, green and seasoned chips, with various moisture contents at the Port Hawkesbury, Nova Scotia site as part of the PERD study. Researchers are returning to the site every three months to split a few bales from each type and sample the moisture content and evaluate the decomposition. Keddy says that preliminary assessments of compacted bales that were produced by the Gyro-Trac BBS system show promising results. “The chips from the bales were still white after two years. The material was as dry, if not drier, as when the bale was created,” says Keddy. For more information about this PERD project, contact CWFC Wood Fibre Development Specialist, Tim Keddy at (780) 435-7212 or tkeddy@NRCan-RNCan.gc.ca or Derek Sidders at (780) 435-7355 or Derek. Sidders@NRCan-RNCan.gc.ca. For more information about this collection and compaction system, check out www.gyrotrac.com.